The E-BPJ is an international multidisciplinary Open Access Journal which adheres to the BOAI definition of open access: that users have the right to ‘read, download, copy, distribute, print, search, or link to the full texts of these articles’. It is currently indexed in the Clarivate Analytics (Web of Science), DOAJ and SCIENCEOPEN. 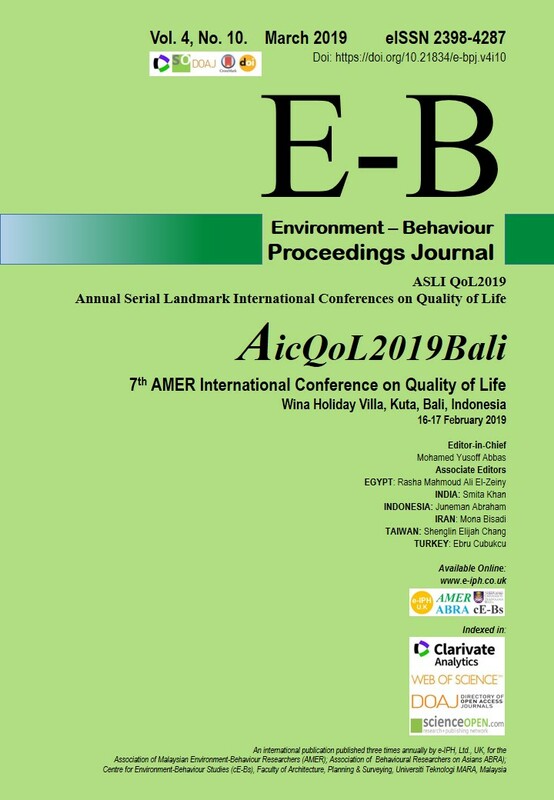 It publishes double-blind peer-reviewed, original research conference papers relating to Environment-Behaviour, General Psychology, and Quality of Life issues affecting the Asian communities living in both the Asian and non-Asian countries. The selected papers published were presented at the multiple serial annual international conferences (Memories) held worldwide since 2010, jointly organised by the Association of Malaysian Environment-Behaviour Researchers (AMER), Association of Behavioural Researchers on Asian (ABRA), and Centre for Environment-Behaviour Studies (cE-Bs), Faculty of Architecture, Planning & Surveying, Universiti Teknologi MARA (UiTM), Malaysia. More information about the submission process can be found at Forthcoming conferences. The Paper Processing Charge (Publication Fees) is @ USD250 per full paper, for successful full paper to be published. Commencing 2018 the E-BPJ shall be published three times annually, excluding Supplementary issues. Published by e-IPH Ltd UK.